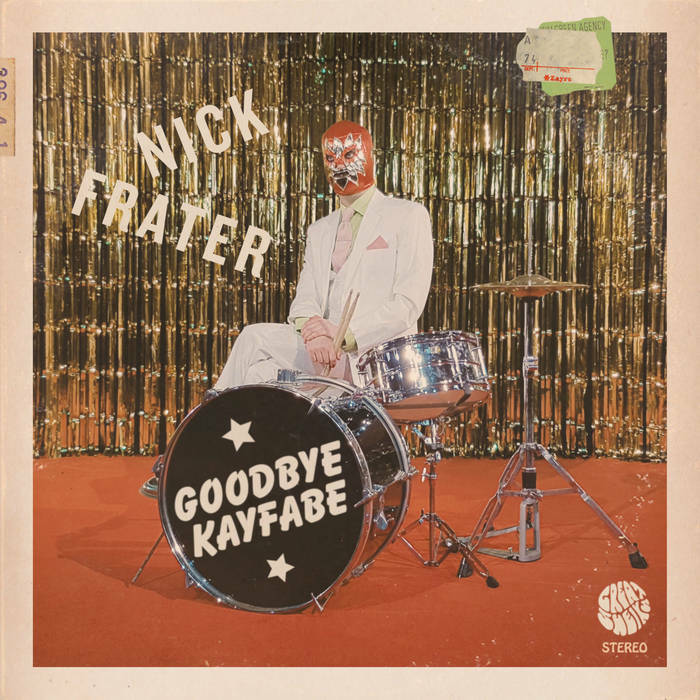 My friend Nick Frater, the creator of a series of slightly barmy power-pop gems, has a new release – a 7-track EP (or possibly a mini album – the distinction eludes me) called Goodbye Kayfabe. That’s Nick in the white suit and lucha libre mask. Nick’s music reminds me of Jellyfish’s incredibly knowing but lovingly crafted meta pop – opener Built to Last recalls that band’s Spilt Milk standout Joining a Fan Club – both songs pull off that Paul McCartney trick of having about five different sections, each hookier than the last. Lead vocals on Built to Last come from Nicolai Prowse of Do Me Bad Things (drums throughout are by DMBT drummer Tommy Shotton, who plays a blinder) but elsewhere it’s Nick, with some help from a Lewitron – Nick’s homemade Mellotron featuring the voice of another Do Me Bad Things alumnus, Alex Lewis. Nick, as you may have guessed, is a recording nerd. For real. He’s got it worse than me. But while that may not be great for his own sanity, it means that his songs benefit from smart arrangements and well crafted instrument sounds, as well as a meticulous mix that includes loads of cool details without crowding the vocal and critical instruments. So Built to Last features a triple-tracked bass line and a Hohner Pianet doubling the guitars, More Than This (not the Roxy Music song), has a real brass band on it and a trombone solo, while Paperchase has a lot of cowbell, a bunch of Nick’s antique synths and a drum track that quotes from Ringo’s Ticket to Ride beat. Nick saves two of the strongest tracks for the end. Remoaner, like Donald Fagen backed by ELO, has some of the juiciest chord changes I’ve heard in a long time, while the lovely Asking for a Friend (written in 10 minutes, Nick says – the best ones always are) finishes things off on a wistful note. Nick’s put out a fair amount of music in the last five years or so, so if you dig any of what you hear on Goodbye Kayfabe, be sure to check his older releases too. This entry was posted in Music and tagged Do Me Bad Things, ELO, Goodbye Kayfabe, Great Sheiks, Jellyfish, Nick Frater, power-pop, Prog on April 3, 2018 by rossjpalmer.